The Beauty of this magnificent rug cannot be explained, it has the most intricate design pattern which is totally inspired by the wildlife. It has taken more than 2 years to weave this "One of a kind" handmade carpet which you can never find anywhere in the world. This gorgeous carpet is only available on Rugs and Beyond and beautifully handcrafted by our skilled weavers. The defined and intricate design of this pure New Zealand wool area rug is inspired by the art of Persia and mixed with Kashmir craftsmanship in India. The bright appearance and soft and cosy touch feel of this rug make it stand in the category of royal rugs. Beautiful motif design, quality material, reasonable prices and hand knotted craftsmanship make this wool rug an irresistible choice for our every customer. It contains Tree of life design pattern which is well known by carpet lovers. This design has been originated in 19th century. 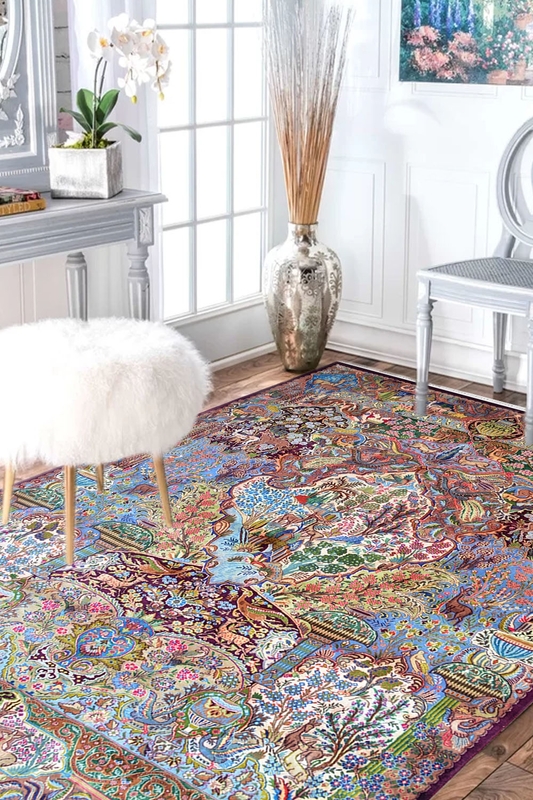 This carpet contains bold and tiny motif combination including tree, flowers, deer or we can say that weavers have woven exact wildlife on this carpet. - Process Duration: More than 2 years.